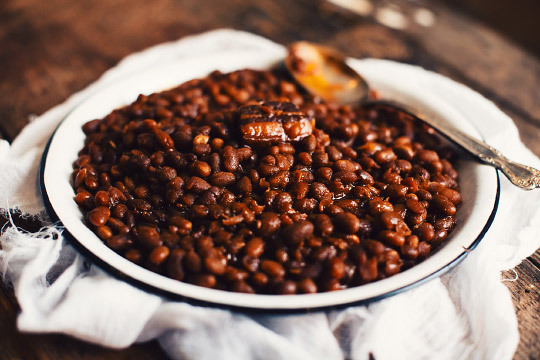 Have you ever tried beans with lard and beer in it? This slow cooker recipe is legendary! The Trois-Pistoles beer has strong malt flavors along with chocolate and brown rum. Aromas that goes perfectly well with the maple syrup and molasses present in this recipe! Place the beans in a big sauce pan then pour the maple syrup and beer over. Add enough water so that there is about 5cm of liquid over the beans. Stir well and cover. Let soak for 12 hours while stirring from times to times. Add water if necessary, beans need to be under the liquid at all times. After the soaking period, put the pan on the fire at high heat and bring to a boil. Lower heat then simmer for 30 minutes while stirring delicately from times to times. Remove from heat and drain beans. Set aside. In a big slow cooker, place half the lard in the bottom and put one half of the onion in the center. Pour the beans over everything. In a bowl, combine together the dried mustard, tomato paste, brown sugar, molasses, maple syrup and beer. Stir well. Pour the mix over the beans. Do not stir the beans!!!! Add the remaining lard on top of the beans and insert the other half of the onion in the center, until it disappears in the beans. Pour water on top until liquid is barely higher that the beans. Season with salt and pepper. Cover and clow cook at low temperature for 10 hours. You can stir the beans but only once, towards the ends only. ENJOY!!! ***Note : I do the soaking during the day and the cooking during the night. This way, I have a nice surprise when I wake up the day after! A wine with vanilla and woody accents that allows to reach the caramel, roasted and maple flavors of this recipe. An audacious pairing? 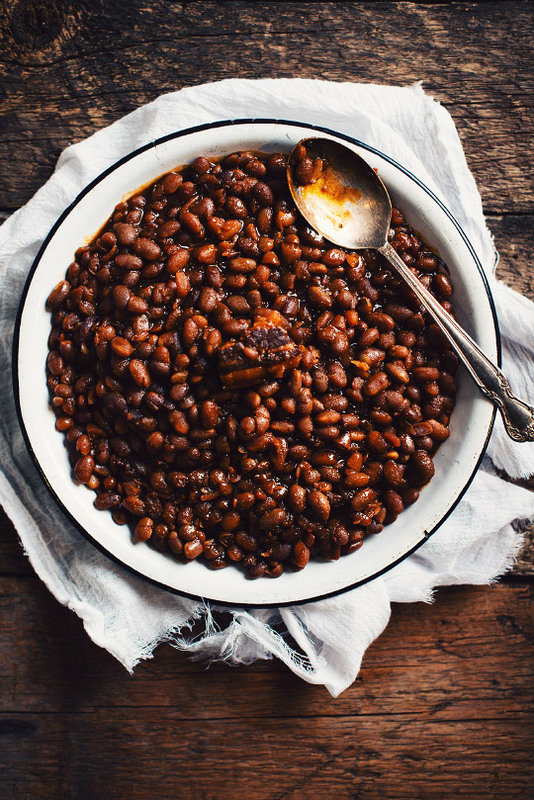 This full-bodied Zinfandel with roasted and spicy notes will perfectly pair with rustic and rich meals like those lard beans. Molasses, maple and brown sugar contained in this recipe will be enhanced by the caramel malts of this German-inspired ale. Offering flavors of barley sugar, dry fruits, caramel and roast, this beer, with a dry and slightly bitter aftertaste, is a pairing of choice with a moderate alcohol content.